Are you doing a “Meatless Monday” yet? The Meatless Monday campaign asks everyone to forego meat one day a week to improve their health and make a positive impact on the environment. It’s a simple idea that’s gaining momentum. There are major campaigns, including Meatless Monday and the McCartneys’ Meat Free Monday. If you’ve seen “Food, Inc.,” you’ve heard that Meatless Monday is one of the top 10 ways to improve our food system. If you caught the “Oprah” episode on eating green, you saw Michael Pollan (“In Defense of Food” ) advocate a Meatless Monday. Just last week, The Huffington Post Green introduced a weekly Meatless Monday column. It’s hard to disagree with the idea of starting the workweek on a healthy note, so instead of posting my favorite vegetarian recipes willy-nilly, I’ll be sharing them every week on Meatless Monday, starting with these Vegetable Fajitas. The filling is a combination of onion, peppers, mushrooms and garlic, marinated in oil and chili powder and then stir-fried. The chili powder brings a fair amount of heat, so I like to pair the fajitas with guacamole and sour cream. And fresh cilantro. And lime juice. All the smoke, sizzle and spice, minus the meat. Because meatless doesn’t have to be boring. In a large bowl, combine the onion, peppers, garlic and mushrooms. Mix the oil and chili powder in a cup, pour over the vegetable mixture, and stir well. Set aside. In the meantime, make the guacamole. Combine the avocado, shallot, green chile and lime juice in a food processor or blender. Process for 1 minute until smooth. Scrape into a small bowl, cover loosely and put in the fridge to chill until required. Heat a cast-iron skillet or wok until very hot. Add the marinated vegetables, and stir-fry over high heat for 5-6 minutes, until the peppers and mushrooms are just tender. Season with salt and pepper. Spoon a little of the filling onto each tortilla and roll up. Garnish with fresh cilantro, lime wedges, sour cream and guacamole. I love veggie fajitas. We don't have a meatless "Monday," but we do eat meatless about once a week, sometimes twice or even three times depending on the leftovers situation and what happened to sound good to me when I was writing the menu. I'm just waiting for some of my garden peppers to turn red and yellow so I can do fajita dinner again. YUM! Same here. We've never scheduled our meatless meal(s), but it's a great idea to keep you more mindful of having one. So jealous of your peppers! Red peppers are $1.50 each here right now. I am now! I'm not a conscious vegetarian, even part-time, but I eat meatless often enough – and enjoy it enough – that being deliberate about it would be easy. Starting with this! I find it challenging to cook beef in my city apartment, so making veggie fajitas would be almost easier for me. That's how we are. We eat meatless at least once a week, but I've never really put much thought into it. This should be fun. Oh, the recipe says it makes two servings of the vegetables, but those are very generous servings, so you could cut the amount in half or just plan for leftovers. Hope you like it! That dish looks so good! I would love to do a meatless meal at least once a week but my husband doesn't eat veggies and considers any meal without meat pretty unacceptable so I'd be doing it alone. I may still jump in, we'll see! Oh, make it easy on yourself! Usually I "recycle" some leftover meat and add it to Jeff's plate. That would be Jeff's kind of "meatless" meal. Bacon as an herb. I can't wait to make these! I'm so glad you're going to feature veggie meals on Mondays. Most of our meatless meals involve fish or yogurt and fruit. I know, variety helps dispel boredom. It's too funny – I actually tend to be meatless 5 out of the 7 days of the week. It's only around the bf (who requires meat) that I'm anything other than veg. I love fajitas though, so this will go in my regular rotation of weeknight meals, because they look wonderful! Yeah, when I'm by myself, I almost always go meatless. I love this recipe, because I can add meat for Jeff (especially leftovers) and keep it meatless for myself. I am a vegetarian so while I not only do meatless Mondays, I also so meatless Tuesday through Sunday as well. :) I just want to tell you how delicious this looks, and to thank you for posting such a yummy meatless meal! Definitely a meal to add to the menu plan for next week! I am totally up for meatless monday, although I actually go meatless quite often. Today's lunch was hummus, veggies and pita and dinner is a veggie burger. Yum! Ooh, sounds good. Do you have a good veggie burger recipe, or do you buy them frozen? I'm looking for a good one. These look incredible! I really appreciate you mentioning Meatless Mondays, since next week marks my 15th year as a non-meat eater. Thanks for a great recipe! I bookmarked it on Delicious. The options are so much better now for vegetarians than they were 15 years ago. And there's not such a stigma. When I was a vegetarian then, my family thought I'd die of malnutrition, probably by ODing on taters. Most of my meals are still meatless. I have an ongoing love affair with Costco's roasted vegetable meatballs. Oh cool! I'm a vegetarian and I've been trying to get my carnivore friends to try "Meatless Mondays" too! I really appreciate you doing this! Especially for the great veggie recipes! P.S. 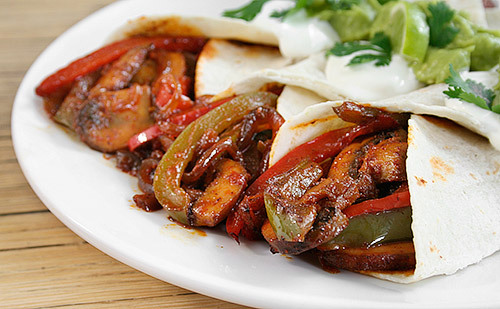 Have you ever tried making caramelized bell peppers and onions for your fajitas using Cavender's Greek seasoning? It's fantastic!!! I practice Meatless Everyday, so these vegetable fajitas are totally up my alley! They look fantastic–thanks for sharing. Oh no! I made steak fajitas last night. I really should try to get on the meatless Monday bandwagon. It's tough when the bf wants meat with every meal… but I'll see what I can do. These look great! I don't eat meat only chicken and fish so these are right up my alley. I'm pretty much meatless everyday. I've never made fajitas at home. I ought to give it a try they look delicious. Those fajitas are looking really tasty! These look fantastic – I would not miss the meat at all! I love the idea of Meatless Mondays! We tend to go meatless here one or two days a week, so why not Monday? We do love alliteration. I'm in! I've always felt that I could be vegetarian but for bacon. Vegan, never, but bacon-eating vegetarian? Yes. I think I'm going to make these fajitas next Monday. Those are some gorgeous fajitas! I love the taste of fajitas but the only time I ever eat them is in restaurants and I hate having to put them together. All of our seven day meal planners have meatless mondays too! Great recipe! Yeah for meatless monday! We've been doing it for a while now and love it! It is a great break from all of the heavy stuff that usually takes over our weekend. Those fajitas look great, I'm adding that to the rotation! This is so good. I used cumin instead of chilli powder(kids) and roasterd the veggies(carrots,peppers,onions,asparagus) in a 425 oven for 10 min. Really tasty and we dont miss the meat. I add the chili powder or Mrs.Dash Chipotle spice on mine at the table. Great with home made flour tortillas! !